Written as a tribute to the toughest position in hockey and the men who have stood guard over their nets. 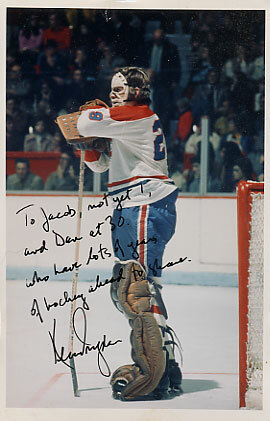 There's a story behind that Ken Dryden autograph. I was a goalie in my peewee days, might have gone on to great things if I hadcn't given up hockey for booze, girls and drugs. Ken Dryden was always my hero, his stand-up style, his casual stance, his fearless and overt intelligence. I sent him and ten other nhl goalies a copy of the CD and a little letter telling my story and how I look forward to telling my children about him and his brothers. Of all of them he was the only one to reply, sending this personal and thoughtful autographed photo. In contrast, it took the music editor at the Georgia Straight almost 6 months to review the disc.